I don't have the greenest of thumbs, but with spring in full force where I live, I am eager to get outside and play in the dirt. Not all of us have a lot of land to work with, but these small space garden ideas prove that it's no excuse not to get growing. You can line an outdoor wall with plants using Wooly Pockets. They're lined with moisture barriers so you won't get dripped on when you're sitting outside enjoying their beauty. Check out tons of inspiring images in their gallery. Another rad vertical solution is to use a pallet to create your garden. Just be sure to choose a pallet that has been heat-treated as opposed to fumigated if you're growing fruits or veggies. Pippa used a shoe organizer to get her garden on. This would be great for herbs, especially mint which spreads everywhere if it's planted in the ground. How great would it be to have it within reach of the kitchen door! If you're feeling really industrious, this deluxe garden tower can handle lightweight edibles like strawberries, lettuces, arugula and radishes. You can also make a smaller version for about $140. The Verti-Gro garden system yields a lot of plants in a pretty small space and even comes with an irrigation system built in. The cute little garden helper in Erika's blog is, sadly, not included. Have garden, will travel! Kristi gives a full DIY tutorial on how to build this elevated garden bed. The best part is, if you move you can take it with you! I thought this was a brilliant, space saving way to kill a large patio umbrella and a container garden with one stone. (Isn't that how the saying goes?) A little concrete mix in the bottom of the planter keeps the umbrella steady. Get the full how-to. Succulents and I have a love/hate relationship. I love them. They hate me. But if you're lucky enough to live in a dry climate where they flourish, this blog post has some gorgeous inspiration for incorporating succulents into your container gardens. So are you full of ideas and ready to go dig in the dirt? Or are you ready to plop down on that chaise lounge with a good book? Either way works for me. 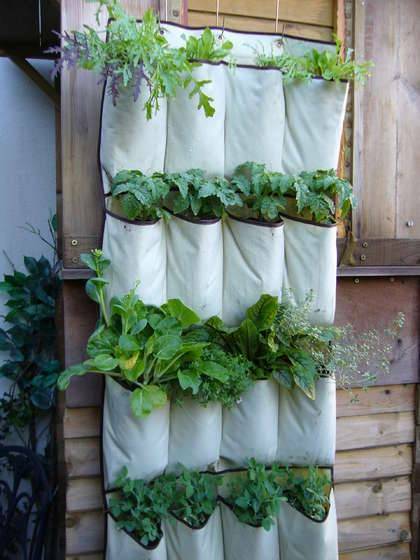 Another rad vertical solution is to use a pallet to create your garden. Love these ideas... Going to def use the shoe organizer idea for herbs this summer! 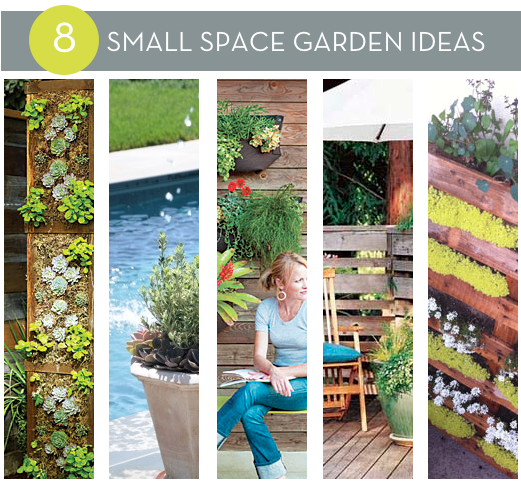 Oh, I love all these solutions for small spaces... great work!